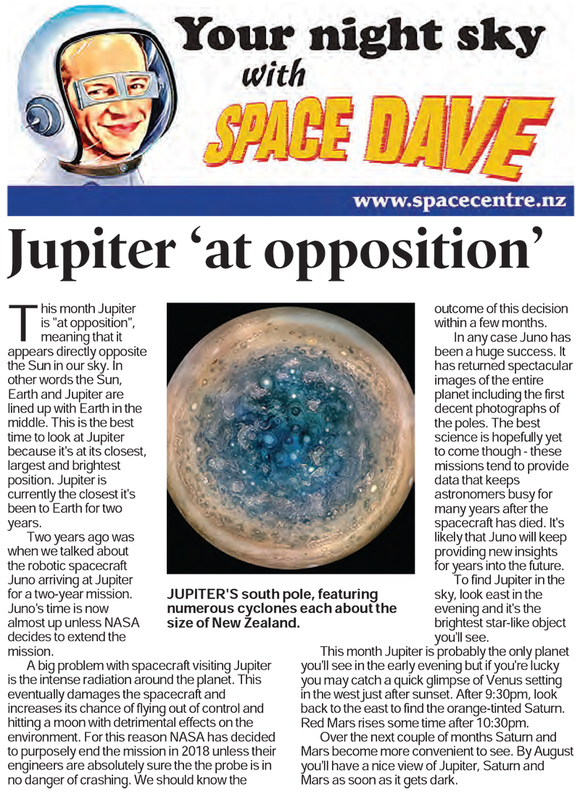 This month Jupiter is "at opposition", meaning that it appears directly opposite the Sun in our sky. In other words the Sun, Earth and Jupiter are lined up with Earth in the middle. This is the best time to look at Jupiter because it's at its closest, largest and brightest position. Jupiter is currently the closest it's been to Earth for two years. Two years ago was when we talked about the robotic spacecraft Juno arriving at Jupiter for a two-year mission. Juno's time is now almost up unless NASA decides to extend the mission. A big problem with spacecraft visiting Jupiter is the intense radiation around the planet. This eventually damages the spacecraft and increases its chance of flying out of control and hitting a moon with detrimental effects on the environment. For this reason NASA has decided to purposely end the mission in 2018 unless their engineers are absolutely sure the the probe is in no danger of crashing. We should know the outcome of this decision within a few months. In any case Juno has been a huge success. It has returned spectacular images of the entire planet including the first decent photographs of the poles. The best science is hopefully yet to come though - these missions tend to provide data that keeps astronomers busy for many years after the spacecraft has died. 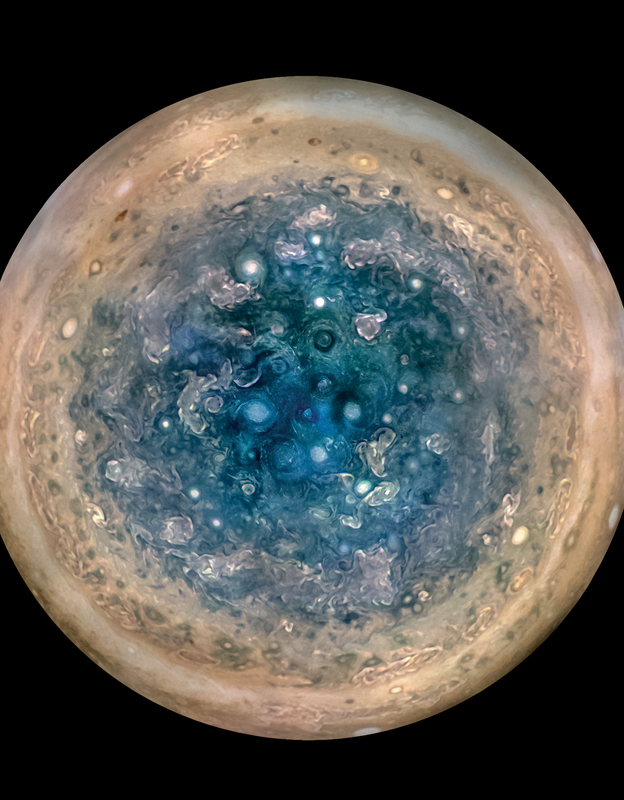 It's likely that Juno will keep providing new insights for years into the future. To find Jupiter in the sky, look east in the evening and it's the brightest star-like object you'll see. This month Jupiter is probably the only planet you'll see in the early evening but if you're lucky you may catch a quick glimpse of Venus setting in the west just after sunset. After 9:30pm, look back to the east to find the orange-tinted Saturn. Red Mars rises some time after 10:30pm. Over the next couple of months Saturn and Mars become more convenient to see. By August you'll have a nice view of Jupiter, Saturn and Mars as soon as it gets dark.